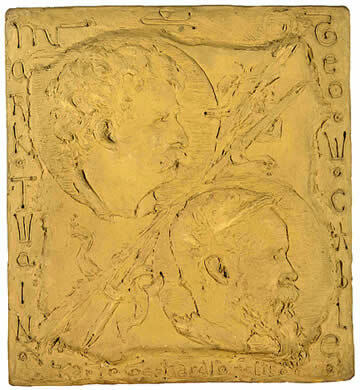 In September 1884, Samuel Clemens requested Gerhardt make a medallion of himself and George Washington Cable. In a letter dated October 14, 1884, Gerhardt requested an advance loan from Clemens of $25 - $30 for the Twain and Cable medallion. Two medallions are currently listed in the Smithsonian's inventory of Gerhardt's works. One clay model is owned by the Connecticut Historical Society. Another terra cotta version is owned by Yale University. Photo from Yale collection of American Literature, Beinecke Rare Book and Manuscript Library. 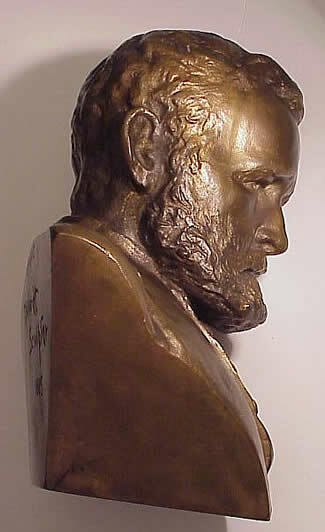 Bust of General Ulysses S. Grant created by Gerhardt in March 1885. The busts were sold by subscripton in bronze and terra cotta versions. Photo used by permission of Cristian Donosa. See additional photos of the Grant bust. A number of the Grant busts are currently listed in the Smithsonian's inventory. 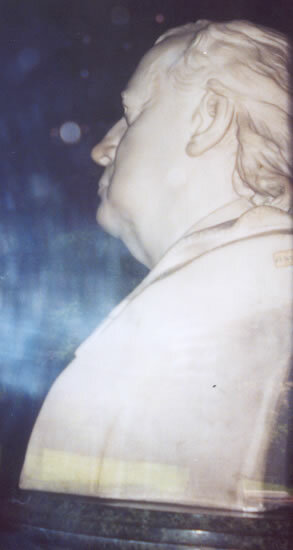 Throughout May and June 1885 Gerhardt worked on sculpting a bust of noted preacher Henry Ward Beecher, brother of author Harriet Beecher Stowe. The bust is listed in the Smithsonian's inventory as being owned by the Stowe-Day Foundation in Hartford, CT. It currently sits in the entry of the Mark Twain House, Hartford, CT.
Nellie Grant, daughter of Jesse Grant; granddaughter of General Ulysses S. Grant. On June 24, 1885, writing from Hotel Balmoral at Mt. McGregor, Gerhardt wrote Clemens that he had his first sitting for "the Grant child." Gerhardt was staying at the Hotel Balmoral awaiting the death of Ulysses Grant in order to be on hand for creating a Grant death mask. Mentioned in a letter to Clemens dated June 24, 1885. On June 24, 1885, Gerhardt wrote Clemens that he had received approval from Mr. and Mrs. Jesse Grant to sculpt a 1/2 size study of General Ulysses Grant. After Grant's death, the Springfield Republican newspaper (dated July 26) noted that Gerhardt had spent time at Mt. McGregor and made a model of the General representing him in his chair in his beaver cloth dressing gown, holding his pencil in his right hand and his writing pad on his knee. On July 25, 1885, Gerhardt wrote Clemens, "The sketch I have not touched since the 23rd the day he died. I had draped it all before that and everybody's enthusiastic over it. I am casting it now." 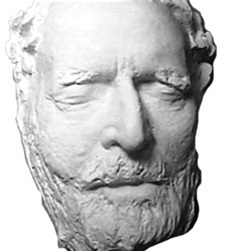 Crude reproductions of Grant's death mask such as the one in the above photo are commonly sold on an internet auction site. For photos of Gerhardt's death mask, visit the Ulysses Grant website. General Ulysses S. Grant death mask. Made by Karl Gerhardt upon Grant's death July 23, 1885. On July 25, 1885, Gerhardt wrote Clemens, "Imagine the trembling Gerhardt taking his first death mask, and from such a personage--It is only nice to think that no one else did it the family did not wish it." The mask later became a source of contention between Gerhardt, Mark Twain and the Grant family. ** Passages from previously unpublished letters: Copyright 2001 by Richard A. Watson and Chase Manhattan Bank as Trustees of the Mark Twain Foundation, which reserves all reproduction or dramatization rights in every medium. Quotation is made with the permission of the University of California Press and Robert H. Hirst, General Editor of the Mark Twain Project.